Hey guys, just for fun was wondering if I could get your opinions on what you think is the ugliest production guitar ever made. Or maybe offer up 2 or 3 or 4! I'm gonna start this off with the esteemed Peavey Razer. Horrible. I want one! Interested to hear some other opinions. Can you possibly beat the Razer? Re: Ugliest production guitar ever! How about the Ovation Breadwinner, the name alone is bad enough. Here's the link to the main site, have a look about.... There's some cool stuff in there! Gotta agree about the Breadwinner, though it was well built and played well... At least the one I had a fiddle with did!! I don't care for the LP shape at all!!! Discuss. Nice call on the Breadwinner. I forgot about that one. Looks like something you'd clear brush with. Cool though. I'm digging that bass on cheesy guitars though it's probably unplayable. Likely any Teisco with those mysterious slide and rocker switches. What the hell did they all do anyway? I dig the Teisco's, Barry! They're the bees knees. Those buttons and switches are known only to the elite. The Zakk Wylde ZV. A cross between a "V" and an SG?! YUCK!!! The Washburn Vindicator. A "V" with a seriously weird hump? It's a pig. The Yamaha Surf guitars from the 80's or whenever. One had a rounded off bottom side and rivals the Breadwinner for nastiness. Those Tonika bodies look like an experiment over at Vox gone horribly wrong. Now that's what I'm talking about. The two Gibson's mentioned, the inverted V and the Zakk Wylde SG-V thing are truly horrible, not even in a good way. How did they green green-lighted? How did I miss those? I guess the Razer does have some competition. At the end of this maybe we'll have to come up with a top ten list. Speaking of Gibson I always thought the Moderne was pretty homely, but that gets a pass cuz of it's mythic status. Now I think it's pretty cool, course i think almost anything korina is cool. Totally agree on the SG-V and Inverted V.
I have a Lindert Loco T model, some think its horrendous, some love it. Les Pauls bore me to death as well but thats a different thing. The Dano Longhorn wouldn't be a long horn without the, um, long horns. And of course nothing sounds like a Dano! The Fly looks like a deranged Praying Mantis alright...but it is an exceptionally good playing, and sounding, guitar series. ctsrulz wrote: ....course i think almost anything korina is cool. Barry wrote: Likely any Teisco with those mysterious slide and rocker switches. What the hell did they all do anyway? Very nice Ice! Did you ever finish it? Would like to see some pics of that. Looks like a bunch of you are on the Electra forum as well. I, also am a fan of Electra's. Started with them (and Westbury, Vantage, Skylark, Aria Pro, etc.) and then found my way to Westone. So many beautiful guitars that you guys think are ugly. The Breadwinner and Yamaha surf guitars are gorgeous, and I quite like all the old Peavey designs and the Dano Longhorn as well! So much personality and such great sounds, much better than a bland Strat, LP, SG, or Tele. And you guys think the Paduak is ugly too! Quite like the breadwinner myself. I think the telecaster's really ugly... and it sounds like poop too. corsair wrote: Hmmmmm......nope, I got nothing! Shame on you John! You have a loving wife, a wonderful family, an outstanding online pal... oh, you meant the link. Anyway, back to ugly production guitars. Anyone got or played an Eastman Airline? Ugly to me but very cool retro axe to others. I see Gibson has been mentioned, but I saw one of those Zakk Wylde abortions yesterday in town and, really, wtf were they smoking when they decided that that was a good design?! Iceman wrote: ...Anyone got or played an Eastman Airline? I had one of these in the shop last week: Airline 59-1P. Replaced the very anemic sounding "vintage single coil" with a SD Pearly Gates HB. Played great then! Tokai Talbo - Looks weird but I still want one because it has a cast aluminium body. Gibson Corvus - Dear Gibson, please stop trying to make guitars that are 'different', they never work. This looks like a can opener. Thanks for the link to those USSR guitars - truly horrible. Here's my least favorite: twice as ugly! this is not a prod model,,,, but i HAD to show it to ya! I really like the Gibson Corvus! And Eastwood doesn't make a single ugly guitar that I can think of. Warrn wrote: I really like the Gibson Corvus! And Eastwood doesn't make a single ugly guitar that I can think of. Eastwood? Wait'da minute.... Clint makes guitars too? I didn't notice until just now that you typo'd Eastwood as Eastman. Actually Eastman's are anything but ugly, especially their thinline hollowbody models. You think that's ugly? Cause I love everything about that puppy. Warrn wrote: You think that's ugly? Cause I love everything about that puppy. Different strokes then, Warrn.... different strokes. I wish the bass version had three pickups, cause five knobs just isn't enough, I want seven! thunder1 wrote: Thanks for the link to those USSR guitars - truly horrible. Ok Thunder, I'm throwing my ugly award on this horrid wretch. You've found the guitar made from the fabled ugly tree. Nothing, and I mean nothing about it is appealing. But someone will love it. 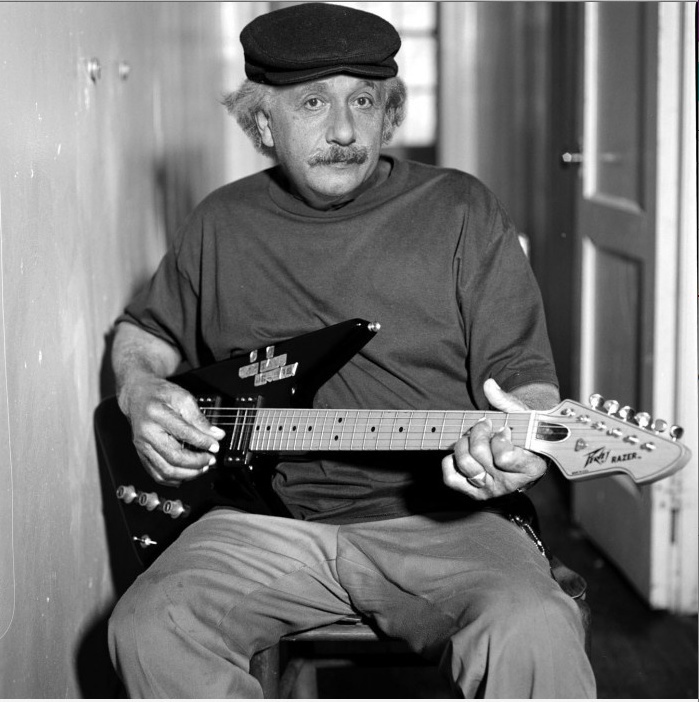 Awlriiiiight Albert! Rawk on bro'! You know, in a relative way.